As a member of the Saint Mary’s University community, please help us to welcome Father James Burns as our next president with prayer. Leading up to this selection and announcement we have been praying for the candidates, the search committee, board of trustees, and our community. We invite you to join us in praying for and welcoming the president by posting a comment below! We are excited for your presence at Saint Mary’s University of Minnesota. With the prayer below, we have been praying throughout the selection process both for you and for our community as we begin a new transition. We hope when you look at this, you will see comments written by our students, faculty, staff, parents, alumni, and friends of the university who welcome you. Through our Lasallian tradition we value community, and we hope as you read through these comments you will feel a part of this community, even before you fully settle in. We are excited for your arrival and are praying for wisdom and guidance for your leadership. All: That we are in the holy presence of God. God, in this time of transition for Saint Mary’s University of Minnesota, we seek your blessing and guidance. We lift up Father James Burns as our next president, may he rely on your wisdom and direction. In the light of our Lasallian Catholic tradition, guide him with a love for this place, for our history and purpose, and for our people. We pray for our community — students, educators, staff, alumni, and friends — that as we enter this time of transition we do so with anticipation, hope, and a desire to embrace God’s plan for the future. We ask for the grace to warmly welcome Father Burns into our community and “together and by association” live fully the tradition of Lasallian education. We look forward to what lies ahead. In the legacy of Saint John Baptist de La Salle, we rely upon your providence to always give abundantly both in our challenges and successes. We call upon you each step of the way and place this process in your hands as you shape Saint Mary’s University of Minnesota and our call to be prophetic in all that we do. We pray all these things through our Lord, Jesus Christ. Lord, keep our new president from harm, to give us peace in times of distress within our campus family, and to give us all advice as we begin our journey to the real world. We are eagerly anticipating your arrival and the start of the next chapter of Saint Mary’s University of Minnesota! Welcome Fr. Burns! We are excited to have you join our community. Welcome to Saint Mary’s University of Minnesota! Father Burns, welcome to the Saint Mary’s family! We are grateful to have your vision, experiences, and disposition as a resource and inspiration for the important work that lies ahead for all of us. Welcome Father Burns! I pray that the St. Mary’s community surrounds you and lifts you up in your early weeks as President. I pray that you will feel a warm welcome and feel a part of the community from your first few steps on campus. Please give the community, Father Burns, and the transition team extra patience and kindness and the transition and changes occur. Welcome to Saint Mary’s Fr. Burns! Let your heart be filled with kindness and knowledge. Lord please grant our new president guidance and love do that he may help strengthen this community with the gifts and talents that he possesses. Amen! Welcome to the Cardinal family! Lord, please guide Father James Burns during this transition. May your pour out your blessings upon him and grant him peace and hope. Open the hearts of the Saint Mary’s community to receive Father Burns and all that he has to offer. Welcome Father Burns, and I hope you feel at home at Saint Mary’s! Lord, Please help Father Burns and Saint Mary’s University in this time of transition. Help all of us to be open and willing to do as You are calling us to do and to help shape those around us on this campus into those people who most emulateYou. Help Father Burns to feel Your love in each and every person he encounters on this campus. Father Burns, we are so happy to have you and blessed to call you our new President. May God keep you ever close to his heart. Saint John Baptist De La Salle. Pray for us. Live Jesus in our hearts, forever. We welcome you to Saint Mary’s Fr. Burns! We pray that the transition into your guidance and leadership is smooth. We pray that you follow in the Lords plan for you in our community as we wait in excitement for the new beginnings you bring to this campus. Welcome to Saint Mary’s! As you prepare to arrive we pray for a smooth transition. As you begin your responsibilities of leadership we pray for courage and vision in this complicated time in our world. Let this be a time where you guide us and walk with us to make a difference. We pray that all who learn and work at Saint Mary’s will unite in this time to boldly be the best we can be. We send greetings from Buttimer and look forward to meeting you soon. Welcome Father Burns! Prayers for a smooth transition and peace as you begin this ministry as president! I pray that God give you his spirit and makes your transition smooth and peaceful as you enter into the SMUMN community. I pray God bring enjoin the students and yourself together so that you can pilot the mission of St. Mary’s University into the next 100 years. St. John baptist DeLasalle pray for us. Hi Fr. Burns, welcome to Saint Mary’s! Praying for your smooth transition to St. Mary’s and the following years to come. May you continue to lead SMU into a future continuing all of the positive aspects of our community. Welcome Fr. Burns! We ask God that your transition is smooth, as well as full of excitement. Also we ask God to guide you, as you help guide our campus. Please be the image of joy and hope that so many people need in our world today. Welcome to this wonderful community of St. Mary’s University, Fr. Burns! I pray that there are many impactful moments throughout this transition and that every student is as receptive to your guidance as can be this year and for the years to come! Welcome to Saint Mary’s University! May your travels be safe and your reliance on God be the grace for families, students, faculty and staff alike. I look forward to a new year full of miracles and blessings. Welcome to St. Mary’s Father Burns. We are all so excited to have you! I ask God to watch over the whole community as we make this transition. Remember to let go let God at hard times. Also please take the time to explore campus as it will bring peace into your life. Welcome! Wishing you a joy-filled transition to your new community at SMU. Looking forward to meeting you. Welcome to Winona and to the Saint Mary’s community, Fr. Burns. As a relative newcomer to this area (6 years to Winona and nearly 4 years at the university), I pray you find it as vibrant and welcoming community as I have experienced. We look forward to collaborating with you in advancing the mission of Saint Mary’s. Father Burns, Welcome to Saint Mary’s! I hope you are excited to be a part of this community, we are excited to welcome you here! I hope you have a good transition into this new chapter in your life. You will be in the prayers of all the Saint Mary’s community members! Welcome to Saint Mary’s Father Burns! We hope that you are excited to be here and we are excited to have you as our new president. Prayers for a successful transition into the Saint Mary’s community and that you can call Winona your new home. Father Burns, we are so excited to have you with us here at Saint Mary’s! I hope this journey and transition for you is nothing but the greatest. God Bless! Lord Jesus, we thank you for blessing our University with our new president, Father Burns. We ask that you not only guide him with your spirit in leading Saint Mary’s University, but we also ask that you open the hearts of all of the members of our community so that we may support Fr. Burns the best that we can! In your name we pray… Amen. Welcome to Saint Mary’s, Fr. Burns!!! We are so excited to have you with us – see you on campus soon! Welcome to St. Mary’s University! We will be dropping off are son as he will be freshman this year. He is coming from St. Agnes Catholic School as you attending as well. We are excited to have you on campus and heard many great things about you! Welcome Fr. Burns, to a great community we all love to call home, Saint Mary’s University! We have been patiently awaiting your arrival and are eager to meet you. I pray that you have a smooth transition and know that the Saint Mary’s community is behind you. We are looking forward to all that you will do for this University and the impact you will have on the students, staff and all those connected to Saint Mary’s! Welcome to the Saint Mary’s family, Father Burns. We look forward to your leadership and offer our support to you. May God bless you as you undertake the important work of the presidency during this time of great momentum. Welcome to Saint Mary’s, Father Burns! Praying for a smooth transition and that you feel warmly welcomed! We are happy to welcome you at SMU. Our prayers for you and all SMU Community. Welcome!! We’re excited for your arrival!!!! Welcome Father Burns. I pray that you have a wonderful experience here at Saint Mary’s and I pray too that the Lord guide you as you begin this journey with us and our university community. I look forward to seeing how you drive this community forward and what you will add to our campus. May the Lord bless you in this journey as you lead us at Saint Mary’s. Welcome Father Burns! I pray that you come to love the Saint Mary’s community as much as I do. God bless! Welcome Fr. Burns! As a current participant in the Buttimer Institute for Lasallian Studies (3rd and final year), I hope and pray that the transition to your new role at Saint Mary’s is guided and embraced by our caring and beloved Lasallian community. As a Lasallian community, together and by association, we pray that all good things be yours as you arrive at Saint Mary’s. We look forward to doing great work with you. Best wishes for every success. I pray that your welcome to our Saint Mary’s community might be some reflection of the depth and richness of our identity and emerging potential Father Burns. Finding myself tenderhearted as we remember our friend and colleague Dr. Rose Beal, I am reminded of the importance of the practice of love in our shared pursuit of excellence and humanizing community. My prayers are with you and will remain with you as you unfold the leadership that will enrich each and all of us. Welcome to Saint Mary’s community! I pray that our Lord guides you in every step and eases any tension you may have in transitioning to St. Mary’s. We’re all very excited for your arrival! Welcome to Saint Mary’s Fr. Burns. Our thoughts and prayers are with you in this time of transition for you and for our University. We are looking forward to your arrival and the work ahead. Welcome to Saint Mary’s, Father Burns! We are so pleased that you have been selected as the 14th president of Saint Mary’s University of Minnesota. We eagerly await your arrival. Please know that you are in our thoughts and prayers as you make the transition to Saint Mary’s and the critical role of university president. May God bless you today and every day – together and by association we will do great things for Saint Mary’s! Father Burns, I regret not being able to meet you in person during one of the upcoming welcoming receptions to be held in your honor, but I look forward to speaking with you when I am next on campus in Winona. In the meantime, please know that my prayers and best wishes are with you as you assume the leadership of an educational community that is dear to my heart. Thank you for your commitment to the history of St. Mary’s as a Lasallian institution and for strengthening its reputation as one of the most highly respected and innovative universities in the greater Midwest. Welcome to Saint Mary’s University. I look forward to meeting you in person next week. Know that you are in my prayers as you prepare for the transition ahead. Father Burns – We are excited to have you here, and hope your transition is smooth. May a god bless you and guide you as you lead us in the future. Welcome! Welcome Father Burns! I pray you are filled with wisdom, discernment, and anointing as you take on this new role. My mother loved the Catholic Church and attended college in Winona along with her sister’s whom became nurses. She gave me her bag which reads, “Teresan Today, Teresan Always.” I am currently working on my bachelor’s degree and celebrating the gift of knowledge instilled through instructors such as Marcia Hines whom are passionate and excellent educators. I wish you the very best and continued success. https://www.fastcompany.com/40571812/the-nonprofit-sector-is-the-third-largest-employer-in-america Lord Jesus, we thank you for Father Burns. At Boston College, he led the smallest school on campus to become the 4th largest and a huge moneymaker. SMUMN now stares a Golden Goose in the eye. The only question: Is the goose walking towards us or away? St. Mary’s introduced an MA in fundraising 3 decades ago, long before the nonprofit sector exploded as an economic (and career) force in America. [see the Fast Company article referenced above] Now, more than 500 other schools have followed SMUMN’s lead with similar programs … and our position is uncertain. There’s new leadership. New resolve. New faculty (Hi!). Given your specialization in psychology, you might be interested to hear that neuroscience is now widely applied in advanced fundraising and behavioral economics play a serious role. Welcome! Amen. I am a 1958 graduate of SMC (not U at the time) and of st. Paul Seminary 1962. I am a classmate of Fr. John Forlitti and a few other men from St Paul and New Ulm. I am a true Lasallian at heart. St. Mary’s has always ben t the heart of who I am. 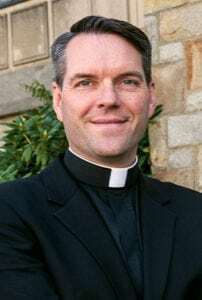 I am a priest of the Diocese of Green Bay and have been on loan to the Archdiocese of Santa Fe for the past 24 years. Currently am Minister to Priests here. My thoughts and prayers are with you as you begin the task of President. May God’s strength and love guide you along the way.